In the Party Mode of Spyro Fusion, you can either replay any of the mini-games that you have unlocked from within the main game (pretty pointless really unless you want practice at them) and of course, the main reason for the Party Mode, multiplayer games. 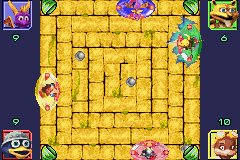 There are three different ones, each can be played with an amount of two to four players. Here you have to deflect the balls into the other opponents goals, you only have a kickback to help you. Other than that you can use speed up ships with L and R. You have a limit of fifteen shots past you till you lose. You are always on the bottom of the screen from your perspective. Once one person is out their goal is sealed up with a green barrier to help speed up the last bit of the game. Winners will recieve either all of the cards that were bet or just an amazing sense of acheivement from beating their stingy friends. This game is identical to Cryo Ball except that you have a strange and rather pointless light on the front of your ship. I don't see a point in it really but there you go. And as before a green barrier will form where people have lost. This time you can attract balls so they stick to you. Hold down B to do so. This can give the game a slightly more tactical twist then the previous versions so use it wisely. In every other respect it's identical to Cryo Ball. The twist here is that there are balls that will attack you. You'll need to avoid these. No magnetism here I'm afraid. This is doen by several items that will popup throughout play that will either help or hinder you. These are; Reverse Controls, Disable Ship, Decrease Traction and Increase Speed. If the ball goes through the item in the middle, the next victim it hits will be suffering the ailment that it has just picked up. You also have 20 lives in this one. Similar to a game in Crash Bash (the last Crash Bandicoot game on the PSone), N Ballism lets you pick up forcefields. They will apear in your area where you can slide so only one person can potentially grab it. 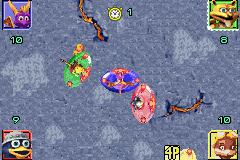 A large red forcefield will form around your ship, defelecting all oncoming balls. 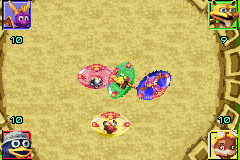 Also from Crash Bash a thing in the middle will occasionally popup and start firing balls at all of you. This set of games is different to Ballistix in that you control a ship but it is free roaming around the area rather then stuck going left and right. 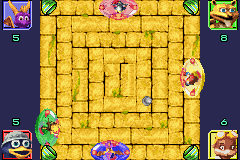 Here your target is to knock each of the other players out of a circle of death. The longer you are out the further your score goes down, so as soon as you get Knocked Out attempt to get back in so as to preserve points. Once you've lost all your points you can aim Nitro Boxes at the remaining players, you can't win by doing this but you can help or hinder the players left in. Totally different premise on this game. 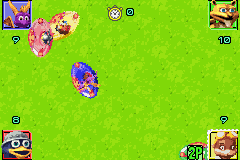 Instead of attacking your opponents you go around capturing sheep. 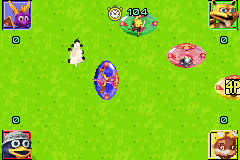 Press B near to a sheep to capture it and then take it to your coloured circle over in one of the corners. Press B again to drop it. Each sheep in your area will give you one point so accidental ones are possible. You can also steal sheep from other people's goals. As you would expect with a name such as Tag, the object here is to not be It. The person who is It is randomly selected at the start and then everyone else must evade being touched by them for four seconds. To tag someone you have to hit them with the A attack. You lose and go out when your score reaches zero. After you are out you can aim crates at the other players. Pickups are around on this level including one that will make you go faster, essential for escaping or capturing. After the four seconds are up and you still are it you lose a point, but you might no longer be it as it will randomly select another person so it is still a possibility to be you. Another classic game premise here. Instead of trying to tag other people, you are trying to keep the gem for ten seconds in order to score. As before, ram other people in order to get the gem off them. 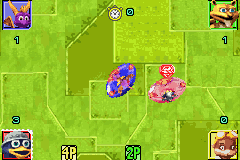 There is also a powerup that will let you freeze all the other opponents from moving for a few seconds as well as a powerup which will prevent others from getting the gem off you. You don't need to have control over the gem for the full ten seconds, just the last one to get the point. And as before, you can tell who has the gem by their picture having as white spikey border round it. The first to ten points wins. Very similar to tag really, but there is a potato involved. 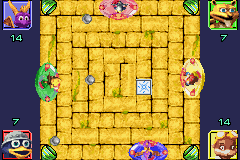 This game can only be played by two players at a time and is identical to all the other iterations of the game in the single player mode. Player Two plays as the Riptoc at the top and Player One plays as Spyro. 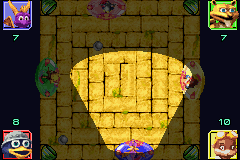 Throw bombs at the opponent to attempt to destroy what they're standing on. 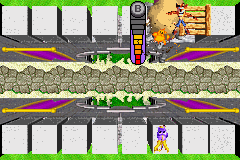 The one difference with this game if you play against a Crash Fusion cart, is that you are Spyro and your opponent is Crash (if you're the one using the Spyro Fusion game). The whole reason why the cards are sorted into different categories (other then being easier to browse) is so that you can have a better advantage over your opponents. Plainly the Red Cards will give you the greatest boost, and green ones will give you the least. As you enter the multiplayer mode (on linkup) you will be asked what value card you are willing to risk on the game (you can also choose not to play for cards). You can't choose the individual card you are risking as that is decided by the game when you lose, just the category. 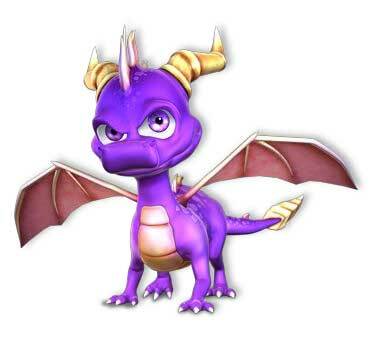 All games are playable with either Spyro Fusion or Crash Fusion cartridges. The only one that is slightly less then obvious to set up is Bridge Fight. Here you need to have both games on the same world Party screen (ie both on Dragon Castles) in order to get the game to work. This also applies if you are trying to play Bridge Fight with Crash Fusion v Spyro Fusion, both in the same world screen. The mini games sound fun. IDK How Cortex and Ripto met. How did they meet? what was that about bling blink???????????? Wehee! Blink! Wehee! Blink! Wehee! Blink! Wehee! Blink! Wehee! Blink! i did the same with my big sister and i was spyro and she was crash! shes not very good at all! Oh man!!! I wish I had a gba connector!!! I Did The Bridge Fight With My Brother And I Was Spyro, My Brother Was Crash. And You've Got To See Artic Cliffs. It's Amazing!